Major Archbishop of the Ukrainian Greek Catholic Church Says War Is "Greatest Humanitarian Catastrophe" Since WWII. The Head of the UGCC: Don't hurry to leave your country! As the crisis in Eastern Europe escalates, the head of the Greek Catholic Church in Ukraine, Major Archbishop Sviatoslav Shevchuk, has decried the war in his nation and has launched an appeal to the international community. In an interview with ZENIT, His Beatitude Shevchuk stressed that this war, which already has 2 million refugees, among them 140,000 children, is not a civil war. In spite of the many justified reasons for his people to be fearful, Archbishop Shevchuk says how his people are still clinging to to hope. In addition to discussing the current situation in Ukraine, he clarifies what’s been misinterpreted and explains what must be understood. The Ukrainian bishops are in Rome for the occasion of their Ad limina visit. They are holding Mass at each of the Papal Basilicas and are meeting with the Holy Father today. The interview was done following the Mass for Ukrainian faithful in the Marian Basilica of Santa Maria Maggiore in Rome. Could you speak a little bit about the situation in Ukraine? 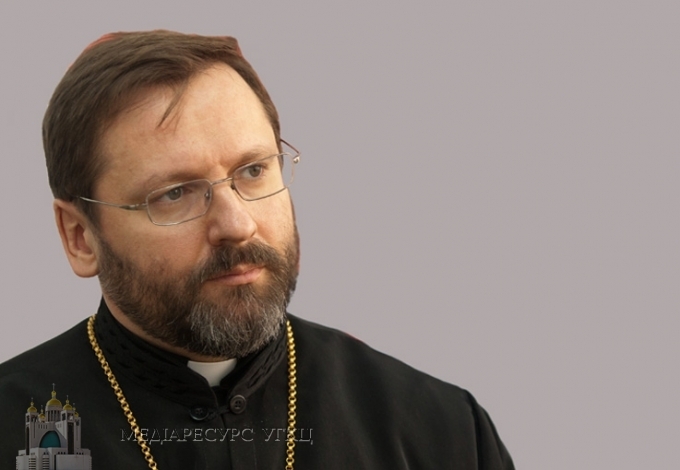 Archbishop Shevchuk: Well the situation we can describe in one word: War. But I have to say that we do not have a civil war in Ukraine. We have an aggression of a foreign country against the Ukrainian citizens and Ukrainian state. A few weeks ago, a ceasefire, an agreement, was signed in Minsk. But, unfortunately, it is not respected. In the last few days, we are witnessing the brutal vandals around the city of Debaltseve. But as pastors, we are concerned about the people who are refugees. We have almost 2 million refugees, right now in Ukraine. Officially, more than 6,000 were killed, mostly civilians. 140,000 children are among those who are the victims. So we are witnessing the greatest humanitarian catastrophe in Eastern Europe after the end of the Second World War. Archbishop Shevchuk: I would like to use this occasion to make an appeal to international community to help us to stop the aggression and to organize the international humanitarian aid to the people of Ukraine. How can your people have hope in the midst of war? Archbishop Shevchuk: Well, first of all: We are Christians. Christians always have hope. But there is also an outstanding phenomenon of solidarity and volunteer movements in Ukraine. Almost 80 percent of the Ukrainians are involved in the different actions of the volunteer movements. Our parishes have become the center of that kind of movement. So the people of Ukraine are fighting for freedom, independence and the integrity of our country. A few weeks ago, there were some negative opinions expressed by the Ukrainian people about some comments the Pope made, perhaps a misunderstanding about the situation in Ukraine. Archbishop Shevchuk: So, we as Christians, we are supposed to be witnesses to the truth. So we are here to convey the truth to the Holy Father about the situation of Ukraine. The truth is that we—the Ukrainian people—we are the victims. And according to the Holy Scripture, God is always with those who suffer unjustly. God is always with the victims. He Himself became a victim in His offering of Himself on the Cross. It is why we expect that the whole Christian world will be united in the solidarity of Ukraine, especially in this difficult period of our history. Would you like to see the Holy See change its rhetoric regarding Ukraine and the situation there? Archbishop Shevchuk: Well, our duty is to convey a truth, not to force someone to change their mind. But I hope that the biggest victory of Ukraine, recently in Debaltseve, is that the whole world [stops] talking about the civil war in Ukraine. And now everybody knows that we are under the direct aggression of a neighbor country.